All summer, the small boat drifted steadily eastward. It drifted across the churning North Atlantic. It drifted until it neared the Irish coast. It made history. It became the first unmanned sailboat to cross the Atlantic. It is called SB Met. It was built by Norwegian company Offshore Sensing AS. It reached the finish line of the Microtransat Challenge for robotic boats on Aug. 26. It finished two and a half months after setting off from Newfoundland. That's according to preliminary data. It's a milestone that shows the technology for unmanned boats is robust enough to carry out extended missions. Such missions can dramatically save money. It can cut costs for ocean research and border security. It can also cut costs for surveillance in rough or remote waters. They're part of wider efforts to develop autonomous marine vessels. Such vessels include robotic ferries and cargo and container ships. These could be operating by the end of the decade. This could outpace attempts to commercialize self-driving cars. "We've proved that it's possible to do,” said David Peddie. He is CEO of Offshore Sensing. It created the oceangoing drones, known as Sailbuoys. "The North Atlantic is one of the toughest areas to cross." Completing the challenge "really proves that it's a long endurance vehicle for pretty much any condition the sea can throw at you," he said. Boats up to 2.4 meters (2.6 yards) long can sail between Europe and the Caribbean or North America and Ireland. That's under Microtransat's rules. They must regularly transmit location data. The Microtransat began in 2010. More than 20 previous attempts by various teams to complete have ended in failure. Robot boats got caught in fishing nets and they’ve been retrieved by ships. Some have even been lost. That's according to the race website. Peddie said his biggest fear was that a passing boat would pick up the two-meter, 60 kilogram (130 pound) vessel as it neared the finish. The company is in a niche field with few other players. U.S. startup Saildrone is building a fleet of seven-meter "unmanned surface vehicles." They can spend up to 12 months gathering ocean data. Liquid Robotics is owned by Boeing and makes the Wave Glider. It is a research platform. It uses wave rather than wind power for propulsion. Bigger unmanned ships are coming, too. The International Maritime Organization is reviewing certain implications. These include safety, security and environmental impact. Offshore Sensing has built 14 Sailbuoys. They have a surfboard-shaped deck covered in solar panels. The panels power the onboard technology. A rigid trapezoidal sail is mounted near the bow. It propels the vessel. In company videos, it looks like a toy tossed about by waves and passing ships. This makes its achievement seem all the more unlikely. Peddie says robotic sailboats offer important advantages. Unlike drifting buoys, they can loiter in one place. They're nimbler and cheaper than research vessels. Sailbuoys can be fitted with sensors. These measure waves and ocean salinity. They also measure oxygen levels. They can be fitted with echo sounders to look for fish eggs and larvae. They can be fitted with transmitters. These communicate with undersea equipment. They sell for about $175,000. This is similar to the cost of renting a research vessel for a few days. The annual World Robot Sailing Championship is a spinoff contest. It is held late in August. It is held in the English port city of Southampton. It also showcases robotic sailing technology. Teams came from British and French universities. They also came from Finnish and Chinese universities. They put their machines to the test in a series of challenges. These included collision avoidance and area scanning. For scanning, vessels had to cover as much of an area as possible. Self-sailing boats operate on similar principles to self-driving cars. They use sensors to scan their surroundings. They feed the data to an artificial intelligence system that gives instructions to the vehicle. 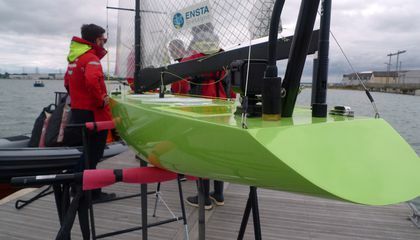 A team from France's ENSTA Bretagne graduate engineering research institute dominated the first challenge, a race around a triangle-shaped course. They did so with their sleek, angular fluorescent-green carbon fiber boat. Servo winches controlled the two transparent plastic sails and the rudder. Wind, GPS and compass sensors fed readings to an onboard computer. Others didn't fare so well. One of the two Chinese teams couldn't stop their boat. It was pushed way off course by the strong tide. "Other ships are thin and long. Ours is too wide and fat," said Hou Chunxiao of the Shanghai Jiaotong University team. Their vessel was a joint collaboration between students and staff from a maritime company run by their thesis supervisor. 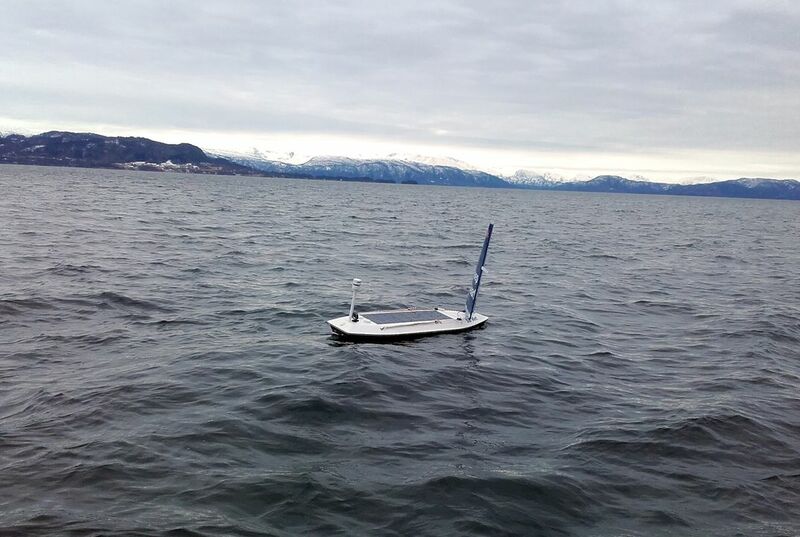 Competitors said smaller and lighter electronics and better solar panels are making it easier to build self-sailing boats. So is 3D printing and other technological advances. "We talk more about autonomous cars or drones, but sailboats are also a big thing," said Ulysse Vautier, of the Plymouth University team. "There's so much to discover on the ocean. With the environmental and ecological problems we face today," autonomous sailing boats are an energy-efficient way to do ocean research, Vautier said. He added that future uses could include swarms of sailing drones scanning the sea floor for the missing Malaysian Airlines flight MH370. It would be nice too see robotic airplanes, but I like the airplanes now, but if technology gets more advanced then I believe that their will be robotic airplanes in the future. Yes a lot of airplanes have an auto pilot mode already. They just need to Optimize the auto pilot, and add an A.i that can receive and transmit data. It must be able to communicate with other planes to not crash. Maybe in the future. Airplanes are very popular for people who love to travel. There will definitely be robotic planes in the future. We already have self-driving cars and self-steering boats. Why wouldn't we develop self-flying planes too? There could or not because robotic airplanes could be dangerous for human life.This is why because they can crash and explode then injure people or maybe kill depending on how dangerous the air plane is.That is why there should not be any robotic planes. That was really interesting they should made a big paper boat. Know that will be more interesting. I feel like this is a good idea. Why, because if we make unmanned vessels that can carry cargo there will be more room because you won't need sleeping quarters or anything to steer. So no one will get hurt. This article was a bout a robot that said all the way across the north atlantic ocean. Then it talked about the different robot boats that were also trying to sail across the ocean.I liked this article because it talked a lot about one subject a lot but it also talked about other subjects to. I like that because I learned a lot of stuff from it. Yes there could be robotic airplanes because of auto pilot.